"She's going to destroy everything my mother created!" Time to fight back against the evil forces! Disney has revealed a second official trailer for their new live-action take on a classic story - The Nutcracker and the Four Realms. Going back to the original story, this one has a darker side (as seen in this trailer) and seems to be a mix of Alice in Wonderland and Chronicles of Narnia. 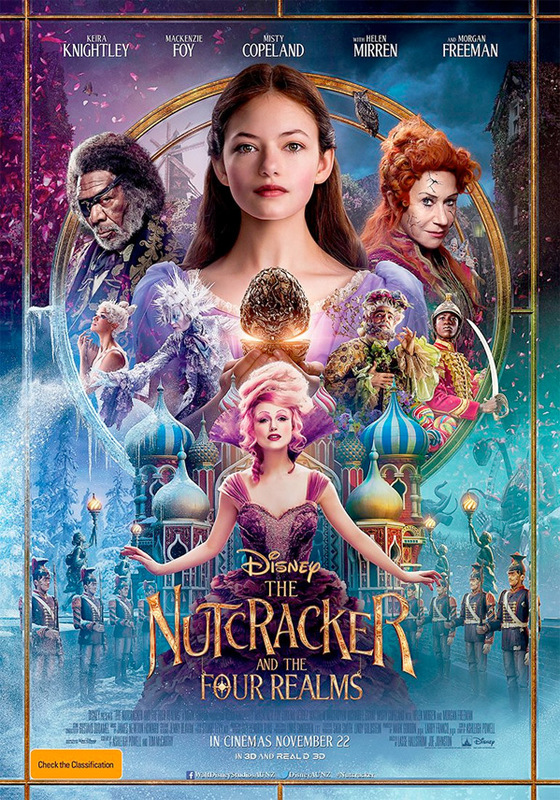 This new movie stars Mackenzie Foy as Clara, who gets lost in another realm where she finds gingerbread soldiers and an army of mice. The cast includes Keira Knightley, Morgan Freeman, Helen Mirren, Matthew Macfadyen, Miranda Hart, Ellie Bamber, and Jack Whitehall. This second trailer features even more magical footage and stunning CGI worlds, with some weird twists and super wacky characters. I'm honestly not sure if I'm excited for this or not - there's just too much going on. I am curious about Lasse Hallström & Joe Johnston co-directing it. You can still watch the first teaser trailer for The Nutcracker and the Four Realms here, to see even more. All Clara (Mackenzie Foy) wants is a key – a one-of-a-kind key that will unlock a box that holds a priceless gift from her late mother. A golden thread, presented at godfather Drosselmeyer's (Morgan Freeman) annual holiday party, leads her to the coveted key—which promptly disappears into a strange, mysterious parallel world. It’s there that Clara encounters a soldier named Phillip (Jayden Fowora-Knight), a gang of mice and the regents who preside over three Realms: Land of Snowflakes, Land of Flowers and Land of Sweets. Clara and Phillip must brave the ominous Fourth Realm, home to the tyrant Mother Ginger (Helen Mirren), to retrieve Clara’s key and hopefully return harmony to the unstable world. 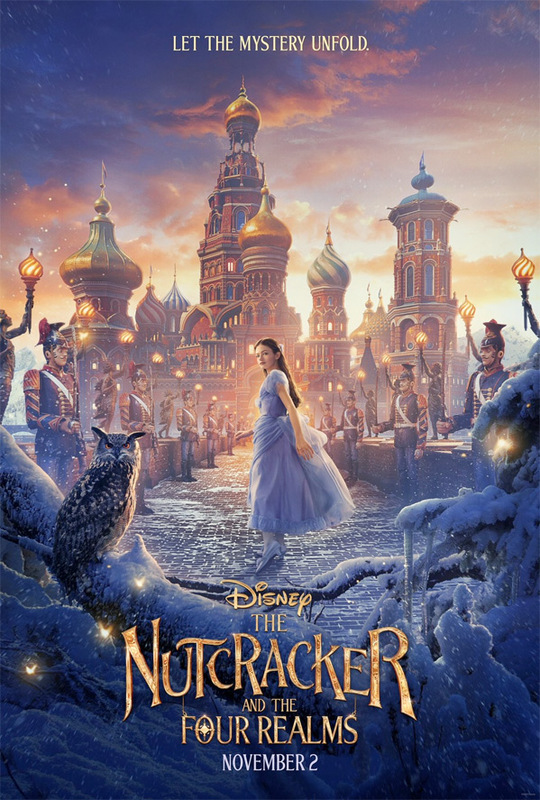 The Nutcracker and the Four Realms is co-directed by Swedish filmmaker Lasse Hallström (What's Eating Gilbert Grape, The Cider House Rules, Chocolat, The Hoax, Salmon Fishing in the Yemen, Safe Haven, The Hundred-Foot Journey, Hachi: A Dog's Tale, A Dog's Purpose) and American filmmaker Joe Johnston (Honey I Shrunk the Kids, The Rocketeer, Jumanji, October Sky, Jurassic Park III, Hidalgo, Wolf Man, Marvel's Captain America). The screenplay is written by Ashleigh Powell; based on the story by E.T.A. Hoffmann. Disney will release The Nutcracker and the Four Realms in theaters everywhere starting on November 2nd this fall.